Political parties in New Jersey are required to hold primary elections.4 Due to the definition of “political party” under New Jersey law, only the Republican and Democratic parties have qualified.5 Therefore, only the Republican and Democratic parties and their members may participate in the primary election process. There is a pending Petition for Writ of Certiorari in the United States Supreme Court challenging the constitutionality of New Jersey’s closed primary election system.11 The lawsuit claims that New Jersey’s current primary election system violates both the 1st and 14th amendments of the United States Constitution. Specifically, the lawsuit argues New Jersey’s closed primary violates freedom of association, the right to vote, and the equal protection clause. Senate Bill 50 (“the Democracy Act”) has passed both houses.12 It would revise New Jersey’s voting and voter registration laws, allowing for things like early voting and online voter registration. 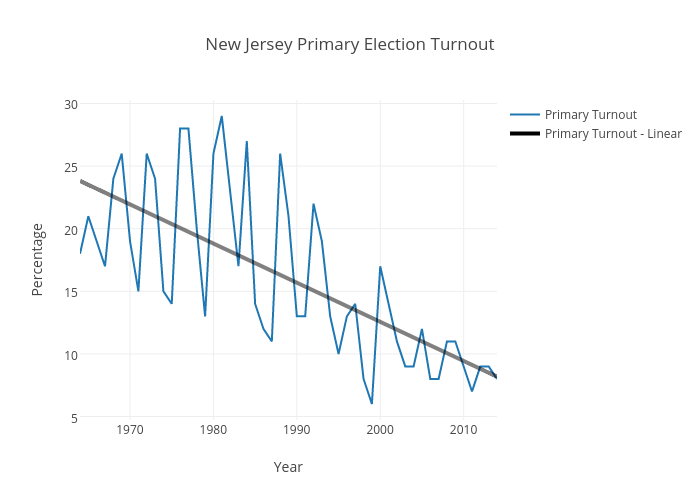 New Jersey’s laws create a system which bars over 47% of its electorate from participation in the primary election process. 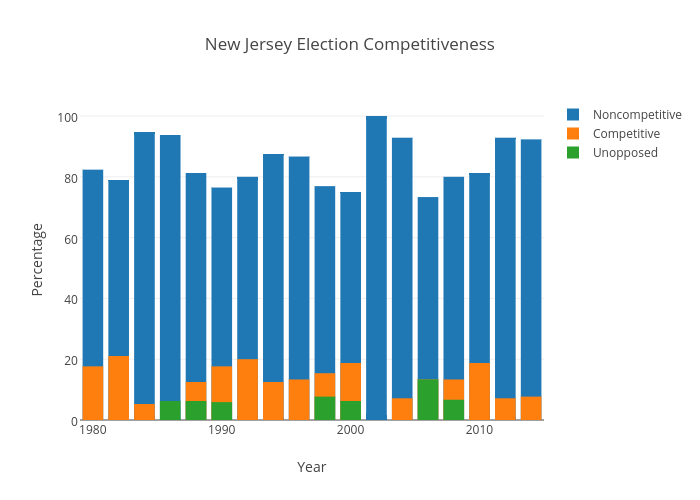 Based upon election competitiveness statistics, New Jersey’s primary is often the only election that has a material impact upon who ultimately gets elected. These elections are also paid for by tax dollars. Therefore, the system is questionable under both the U.S. and New Jersey Constitutions. Basic Facts: Land was donated by a city to a resort corporation. Taxpayers brought suit challenging the donation. Relevant Holding: NJ constitutional provision requires any private appropriation must be done for a public purpose with only incidental private benefits, but public purpose is broadly construed. 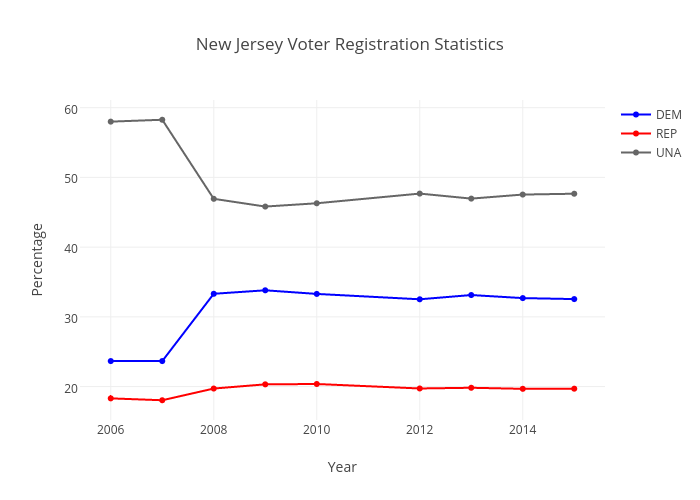 Basic Facts: NJ’s voter affiliation scheme was challenged because of the inability for registered voters to declare an affiliation with an alternative political party. Voters claimed this violated their 1st and 14th amendment rights. Relevant Holding: NJ’s affiliation scheme was unconstitutional because it unnecessarily burdened the 1st and 14th amendment rights to political association. Basic Facts: Plaintiffs challenged NJ’s primary election law requiring party declaration for primary participation. Relevant Holding The primary election law is constitutional was dismissed since the court held it served a legitimate interest in preventing “raiding”, so long as it doesn’t unreasonably encroach upon voter rights. Basic Facts: The city authorized a building be transferred to a private entity for essentially nothing. Plaintiff filed suit claiming this violated the NJ Constitution. Basic Facts: The NJ legislature allowed charter schools to become part of public education. School districts challenged the constitutionality of this. Basic Facts: Plaintiff was an electoral candidate whose nomination petition was rejected because the Secretary of State found that it did not have the statutorily prescribed number of valid signatures. The signatures of unaffiliated voters being counted in two separate elections were also challenged. Relevant Holding: Unregistered voters are not qualified to participate in elections, so their preclusion is constitutional as requiring registration is not an undue burden. Basic Facts: Defendant, a public advocate, represented plaintiff’s adversaries and denied request to appoint outside council and rejected a claim for legal expenses when the PA thought plaintiff’s position was not in public interest. The claims for legal fees were dismissed. Relevant Holding: Simply demonstrating some private benefit to a public expenditure does not make it unconstitutional, as incidental private benefits are allowed. Basic Facts: A candidate wanted to keep his name off the ballot for mayor and the municipal clerk refused because his withdrawal was after their deadline. Relevant Holding: The right to vote guarantees a right to a meaningful vote, so public policy requires election laws do not disenfranchise voters. Basic Facts: The NJ State Treasurer wanted an act allowing public credit to be lent to private entities to be ruled unconstitutional under N.J. Const. art. VIII §§ 2(1), 3(2), and 3(3). Relevant Holding: Expenditures for a public purpose with an incidental private benefit are not unconstitutional under the NJ constitution. Basic Facts: Plaintiff brought an action challenging the elimination of his supervisor position within the government for good faith economic reasons. Relevant Holding: Despite incidental private benefits, expenditures to private organizations are constitutional when a public purpose predominates. Public purpose is broadly construed as an activity that serves a benefit to the community as a whole and related to government functions. Basic Facts: Plaintiffs claim that the development project of the municipality advanced private interests at the expense of public interests. Relevant Holding: Expenditure is for a public purpose where it (1) benefits the community as a whole, and (2) directly relates to the function of government. This must be applied on a case-by-case basis and change according to changes in public needs. Basic Facts: Plaintiff brought a suit seeking to have the primary declared illegal and all votes cast aside. 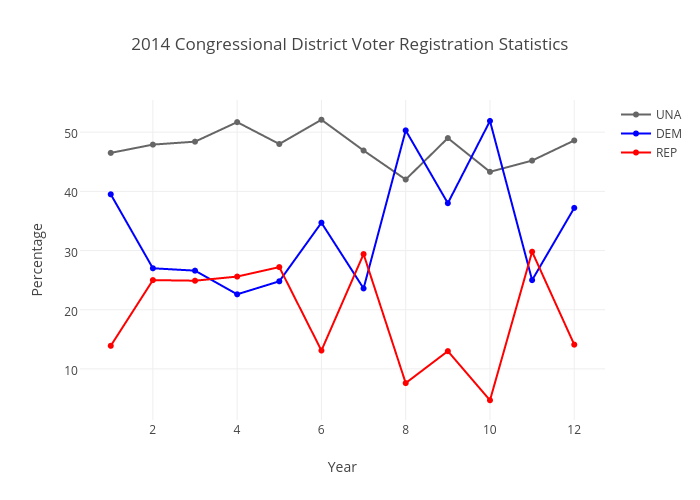 Relevant Holding: Primaries, as a whole, are of public concern. Basic Facts: Voters are required under NJ law to be affiliated with a party in order to participate in primaries. Voters brought suit for violation of 1st and 14th amendments. Relevant Holding: The fundamental right to vote in a primary only applies to voters who register with a state-qualified major party, even when that primary is made an integral stage of the election process. Basic Facts: A teacher filed suit against a public school district under the Fourteenth Amendment. The teacher claimed that the district’s failure to credit his out-of-state experience violated equal protection. Relevant Holding: Where burdens are only incidental and the classification is to further a legitimate state interest, strict scrutiny is not required. Basic Facts: Plaintiffs brought action challenging the constitutionality of the statutes governing ballot access for the primary, claiming that it deprived small parties of meaningful participation in the political process, since it effectively barred political parties with few registered members from the primary and the primary was the only route available to the general election ballot. Relevant Holding: There is no constitutional right for candidates to participate in primaries. Basic Facts: Plaintiffs sued claiming that the deadline for filing nominating petitions violated their rights under the 1st and 14th amendment. While the case was pending, the statute was amended. Relevant Holding: The amended statute was a reasonable, nondiscriminatory regulation justified by important state interests. Basic Facts: A preliminary injunction was granted in favor of plaintiff, a newly arrived resident or Pennsylvania, who received substantially lower public assistance benefits than provided to similarly situated long-term residents. Relevant Holding: State creation of a classification is not per se unconstitutional or subject to higher scrutiny as long as the classification does not burden a fundamental right, target a suspect class, and is rationally related to a legitimate end. Basic Facts: Suit was brought to have a PA law declared unconstitutional which allowed the political party, of which an incumbent who unexpectedly vacated was a member, to appoint a new senator, rather than to hold any primary election to select candidates. Relevant Holding: The Constitution gives states wide discretion for formulating systems for electing representatives, and there is no guarantee of a primary election. PA’s system is constitutional. 2 Ralph Simpson Boots, The Direct Primary in New Jersey 17 (1917). 4 “‘Primary election for the general election’ means the procedure whereby the members of a political party in this State or any political subdivision thereof nominate candidates to be voted for at general elections, or elect persons to fill party offices.” N.J. Stat. Ann. § 19:1-1. 7 As of July 29, 2015.